A golden flurry of walnut leaves fills my backyard—they are always the first to go. Mornings are nippy; coffee tastes good. 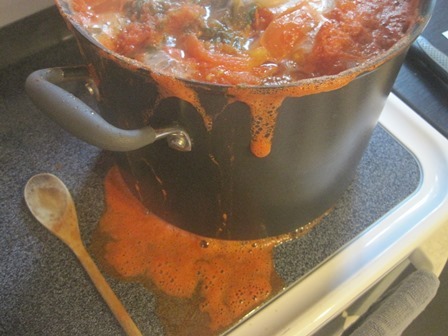 Tomato sauce boils over on my stove. I am sick of canning. A few dried beans today and then I am done for the year, and I say Good Riddance, though I’m happy with the resulting shelves of goodness. I finely diced a whole quart of onions (don’t you love when a recipe says finely diced? )—and cried more than I’d cried over anything for weeks and weeks. I shooed everyone out of the kitchen before it got bad—but Ryan still felt the fumes in his nose and throat and made me pay for it. He said rather loftily that he thought it was more the novelty of homemade salsa than any real superiority. I said, “You shoulda been cutting them if you think you had it bad.” We ate the exquisite flavors in stony silence. It was the next day at lunch, eating it cold with chips, that we laughed. This was after I lured him back to bed with me and right before I spilled coffee over his pants. Sometimes I think I am a high maintenance wife. Harvest. The clouds wear a brooding look found only in September skies. The children load their backpacks every morning. We hear rumors of snow in the west. I feel fully alive in the fall. Definitely the bestest time of year! My favorite time of year! I think it has to do with the coffee and smell of fall. Alison! I’m so happy you’re here!! I’m loving fall. Crisp air, lovely crisp air. 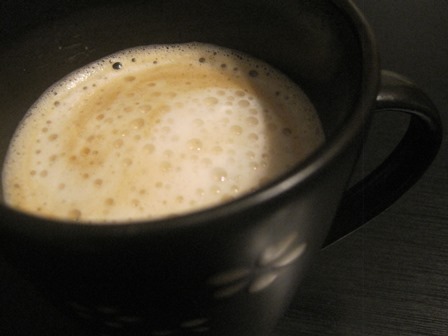 And, of course, coffee being even better than normal. Sitting next to the window in the morning watching it get light. Spending time on a Sunday afternoon reading on a park bench and chatting with my sister in perfect, absolutely perfect weather. Rain and clouds, new school books, cozy evenings, and putting kiddos to bed earlier without them knowing that it is earlier because it is already dark. We did pickled beets last Friday at Renita’s and I boiled beets over on her stove and made pepper jelly that really didn’t get quite thick enough, (because I used my own quince pectin and didn’t boil it the full eight minutes) but it will taste scrumptious with cream cheese and crackers this winter! We ordered four boxes (I think they are forty # boxes of grapes for the first week in October to make into juice! I’m actually loving these cooler mornings and days with little or no humidity. Coffee has always tasted good to me, and I most generally drink it until the pot is empty! I also love, love Fall. Fully alive, yes! The other day I walked out into the brisk, bracing air and raised my arms in joy, embracing the day. Wow. Now that I could handle. The only choppers I’ve seen have been too pricey to be worthwhile for me. Hey, Mr. Not the Boss. Have you bought me a birthday gift yet? Oh, and don’t forget to include chocolate. Hehee. I think I could easily live in a constant state of fall. It’s nothing short of lovely for a sweater and hot drink lover. Tee-hee. This is such a great line! I love to hear about fall from people who love the season. The last few years I’ve been making an effort to enjoy it, and it’s helping. Other people’s enthusiasm (which I glaze over the end of summer and finally listen to when even I have to admit that fall is here) is helping. Fall wins, hands down, for me! And a cup of ‘hots’, be it tea, coffee, cappuccino……..pumpkin cheesecake anyone? Am so enjoying all your posts! Awesome photography in your heading! 😉 Thanks! !